Each March, the Brain Injury Association of America (BIAA) leads the nation in observing Brain Injury Awareness Month by presenting and leading a national awareness campaign. The theme for the 2018 to 2020 campaign is Change Your Mind. 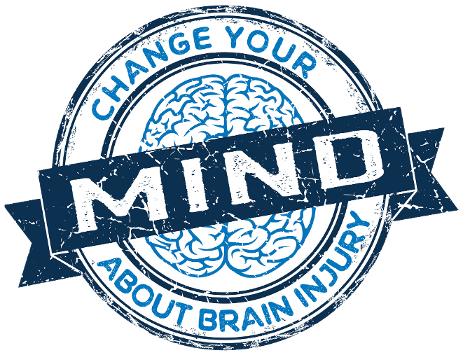 The #ChangeYourMind campaign is a nationwide call to action for all brain injury advocates to join BIAA and its network of state affiliates, chapters, and divisions in improving the quality of life of every person impacted by brain injury. Join the commitment to ensuring everyone in the United States who sustains a brain injury is diagnosed, treated, and accepted. The #ChangeYourMind campaign provides a platform for educating the public about the incidence of brain injury and the needs of people with brain injuries and their families. The campaign also lends itself to outreach within the brain injury community to de-stigmatize the injury, empower those who have survived, and promote the many types of available supports. Hickory Brain Injury Support Group is one of the only local supports groups of its kind in the state. The group was started seven years ago by Travis Glass, a traumatic brain injury survivor. Other brain injury survivors and supporters attend regular monthly meetings and the group actively offers help, hope, and education, so you can live a happy, successful life after brain injury. Meetings typically occur on the fourth Tuesday of each month, from 6-7:30 p.m. For more information, contact Travis Glass at 828-781-0778 or travis@crossroadscounseling.org, or check out their page on facebook.com/HickoryBISG. The next Hickory Brain Injury Support Group meeting is Tuesday, March 26, starting at 6 p.m. at First United Methodist Church, 311 3rd Ave. NE, Hickory, NC 28601. At this meeting, Travis will lead the discussion about some examples of stressors and anxiety common for individuals with brain injury. Discussion will include techniques to manage stress and anxiety after brain injury. If you have examples of specific challenges or coping skills, please bring them to the group meeting. Another topic of importance to be discussed will be Hickory Brain Injury Support Group developing a video advocating brain injury needs in Hickory and beyond. If you have any streaming, video, or advocacy ideas please bring them to the meeting. The Brain Injury Association of North Carolina (BIANC) is a 501(c)(3) non-profit organization and an affiliate of the Brain Injury Association of America. Founded in 1982 by families and concerned professionals, BIANC has a mission of offering help, hope, and a voice for people with brain injury and their families. BIANC strives to create a better future for the 200,000 North Carolinians living with brain injury. This is achieved through prevention, support, education, and advocacy programs. They want to help you find resources and link you with services in your area to meet your needs. Staff and volunteers want to talk to you and answer your emails or inquiries. They hope you will visit one of the five Brain Injury Resource Centers. For more information for how they can better serve you, email bianc@bianc.net or call 919-833-9634. BIANC is working to improve their website to make it more user friendly and full of helpful information, articles, and resources. NC Sibs is a statewide network for adult siblings of individuals with developmental disabilities developed by First In Families of North Carolina through a partnership with the National Sibling Leadership Network and funding from the North Carolina Council on Developmental Disabilities. NC Sibs is the first ever network of its kind in North Carolina. The purpose is to connect siblings with one another to provide support and information specific to the unique aspects of the adult sibling relationship. Brain injury Association of America encourages you to speak to a Brain Injury Expert. Call the National Brain Injury Information Center at 1-800-444-6443. You can also learn more about brain injury online at www.BIAUSA.org. To share your story or read the advice from other brain injury survivors, visit BIAUSA.org/Community. And if you need help getting justice, speak with a Brain Injury Preferred Attorney by visiting BIAUSA.org/Attorneys. Relatives and guardians providing the new Community Living and Supports services for someone on the Innovations Waiver are called Relatives as a Direct Support Employees. Community Living and Supports services keep members on Innovations living in the home they choose. Sometimes, such as in very rural settings, Community Living and Support services are not available from a provider. To teach the Innovations recipient independent living skills, provide proper supervision, and create support systems in the community, the relative or guardian is hired to perform the services. Only Innovations Waiver participants 18 and older can have a relative provide services. To provide services, the relative or guardian must live in the same home as the person on the Waiver. The provider can’t be the spouse of the participant. Also, if the relative or guardian is an employer as part of the Individual Family Directed option, they cannot become a direct support employee. The typical relative does not provide services more than 40 hours per week. Relatives and waiver participants requesting more hours will have to prove the services are not available from any other provider, but also ensure the individual will not be isolated in the home. Services delivered by relatives and guardians go through an approval process and are monitored monthly by care coordination staff to be sure the person on the waiver is having their needs met in the best possible fashion. All necessary forms, documents, and applications are on the RADSE page in our Provider Knowledge Base. Partners is conducting a member-focused survey. In mid-February 2019, a total of 1,200 members were randomly chosen to receive the survey in the mail. The survey is being conducted by the Mihalik Group of Chicago, Illinois on behalf of Partners. If you receive a survey, please complete it and return it in the pre-paid envelope. If you have any questions about the survey, please contact your Case Coordinator, your provider, or call Partners’ Access to Care department at 1-888-235-HOPE (4673). The Arc of North Carolina is thrilled to present exciting new speakers and events at a new venue for the annual conference on Friday, March 29, 2019, at The Benton Convention Center, 301 W. 5th St., Winston-Salem, NC. This year’s conference begins with a pre-conference event featuring a movie by DJ Savarese, entitled Deej. The movie follows DJ, a Phi Beta Kappa graduate of Oberlin College, and gives viewers insight into his daily life and struggles as a person who is non-verbal. closing keynote will be delivered by Natalie Weaver, a parent advocating for her child. Natalie is the founder of Sophia’s Voice and co-founder of Advocates for Medically Fragile Kids NC. Learn more about the speakers, agenda, lodging, and registration online at https://www.arcnc.org/conference. Catawba County is need of people to become licensed foster care parents for foster care and for a specialized foster care program called Intensive Alternative Family Treatment (IAFT)®. There is a shortage of people interested in opening their homes temporarily for children in need. Come join Catawba County DSS and Rapid Resource for Families for an informational session on Tuesday, April 2, 2019, from 5:30-7:30 p.m., at Catawba County Library, Newton room 115, West C St., Newton, NC. This event is free. Learn about the need, about the agencies, about the programs, and how to become a licensed foster parent. There will be free food and door prizes. For more information, contact Patricia McClarin at 336-447-0058 or pmcclarin@ncrapidresource.org. Don’t miss the Spring Fling Dance for people 16 or older who are living with intellectual or developmental disabilities. The event is on Saturday, April 6, 2019 from 5-8 p.m., at Bethel Presbyterian Church, 19920 Bethel Church Rd., Cornelius, NC. The dance is completely free and a buffet dinner with BBQ sliders, chicken nuggets, veggie and fruit trays, sandwiches, cookies, brownies, chips and salsa, and more. All you need to do is to come eat, dance, and enjoy. For more information, or to sign up to attend, contact Lisa Hunter at 704-491-7869 or lisarenehunter@gmail.com. This is a two-day experiential training with a goal of providing an overview of Child and Family Team meetings from the family’s perspective. The training seeks to reinforce the idea of “one family, one plan” by addressing Child and Family Teams through the lens of multiple systems as they affect families in their everyday lives. Agency representatives, and parents and family members over 18 years of age, are encouraged to attend. Training is April 8-9, 2019, from 9 a.m.-5 p.m. each day, at Partners auditorium, 901 S. New Hope Rd., Gastonia. Please, register online. For more information, contact Jeanne Patterson at 828-446-4936 or at jpatterson@partnersbhm.org. You are cordially invited to the 11th Annual Arc Benefit Gala and Fundraiser: A fundraising gala to help people with developmental disabilities achieve success. The Gala is on Saturday, April 13, 2019, from 6-11 p.m., at the Gastonia Conference Center, 145 Dr. Martin Luther King Jr. Way, Gastonia, NC. The night includes dinner, music, auction, raffle, dancing, and a cash bar. To purchase tickets, contact The Arc at 704-861-1036 or www.gastoncountyarc.org.